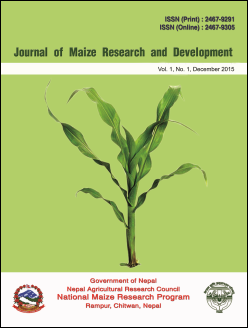 To identify superior quality protein maize genotypes for grain yield under different agro climatic conditions of terai and hill districts in Nepal, the coordinated varietal trials (CVT) were conducted at Dailekh, Doti, Salyan, Lumle and Pakhribas in 2013 and Salyan, Pakhribas and Kabre in 2014 during summer season and coordinated farmer’s field trials (CFFT) at Surkhet and Dailekh in 2013 and Salyan, Pakhribas and Khumaltar in 2014 during summer season. The experiment was carried out using randomized complete block design with three replications for CVT and CFFT. Across the locations and years the superior genotypes found under CVT were S01SIYQ, S01SIWQ-2 and Poshilo Makai-1 where as S99TLYQ-HG-AB, S99TLYQ-B and Poshilo Makai-1 were found superior genotypes under CFFT. The superior genotypes derived from CFFT will be promoted further for similar environments across the country.